All the power most potters ever need! Features a heavy-duty 13" machined aluminum wheelhead and an effective yield of 1/2 HP, enabling you to center up to 80 pounds of clay. Includes reversing switch and splash pan. Call for quote on freight or delivery charges to your location. Not included in Georgies' price. 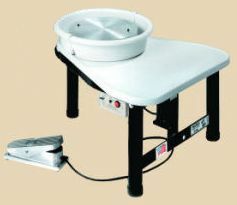 Designed for professional potters who consistently throw large pieces and want plenty of reserve power. Centers over 100 pounds of clay with an effective power yield of 1 full HP. Includes reversing switch and splash pan. The optional electric motor develops 1/2hp and features a variable speed control. 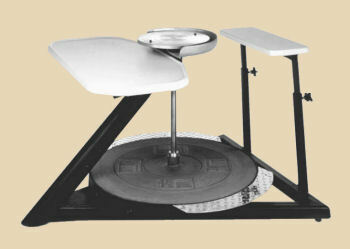 The wheel's seat is adjustable for the best ergonomic height and position.